Very nice Matt. Terrible way to start the day. So if I go fishing for flathead and look down to see a baby one at my feet then catch it by hand, does it still count as a successful trip? I went fishing this afternoon. I was successful! I used a mole cricket for bait, sweetened with a section of earthworm. The Silver Perch fought well and spat the hook a few seconds after my 'apprentice' netted her. As tempted as I was to keep her, I let her go after a few pics because I had already defrosted a few Rainbows for our dinner. 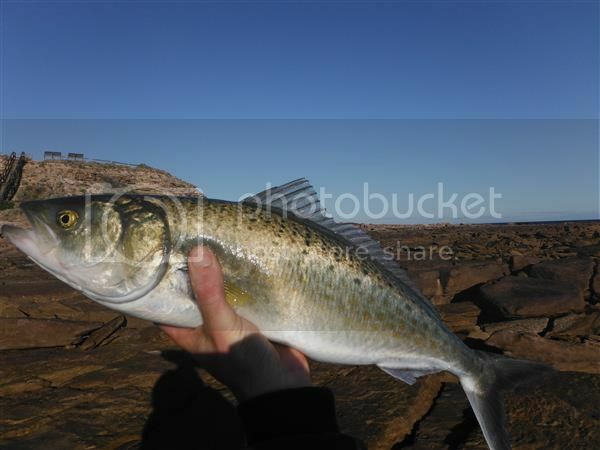 Was fishing the rocks near Whyalla for snapper early last week. And came up with this 60cm+ Salmon Trout! A few fishes I caught last week. Bit of crabbing at Iluka last weekend. Love me some Blue crabs! I love walleye... best eatin fish there is as far as I am concerned. Were you fishing locally? When I think of places to fish...ND somehow isn't on the radar (And I am sure you like to keep it that way! lol). Nice. OK, so I had to go to Google maps and you're right smack dap next to Minnesota which I do associate with walleye... so ignore my ignorance. Spent 10 days on the water in Exmouth in May just gone. 10 blokes, 3 boats and 60 cartons of beer. Brought home about 15kg of fillets each. Mainly made up of Mackies, tuna, shark, Dolphin fish, Wahoo and a bunch of reef fish.